As explained in previous posts, Somatic Cell Count (SCC) in milk and clinical mastitis in cattle are closely related concepts, as these tests provide with highly valuable information to prevent mastitis infections. In this post, we are going a little way further: we’ll give you some useful clues to read sampling results correctly in order to avoid any possible mistakes. WHAT TYPE OF MILK CAN BE MEASURED? A herd or bulk milk tank SCC is effectively made up of the SCCs of the individual cows contributing milk to the bulk tank at that time. It gives an estimation of how widespread infection is (prevalence) within those cows. Somatic cells count in milk is a very useful parameter that helps to evaluate the risk of mastitis in cattle. However, BMSCC gives a poor indication of incidence of mastitis in cattle, as it is possible for a herd to have a low BMSCC with very high clinical mastitis rate. Also BMSCC can be farmer manipulated by keeping milk from high SCC cows out of the bulk tank which reduces the value of the farm Bulk Milk SCC (only cows contributing to milk sold off-farm) compared to the calculated or true milk recording BMSCC (all cows in milk) which gives a more realistic picture of the udder health status of the farm. Which of the two herds needs to receive treatment? The herd number 1or 2? An example of the dangers of interpreting composite cow SCC. 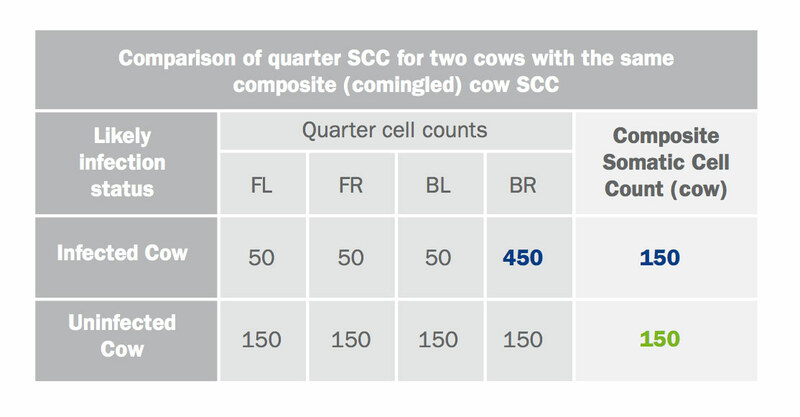 Regular monthly individual cow recording is probably the most common use of somatic cell counting and is almost exclusively performed on a composite commingled milk sample from all four quarters. This does introduce complications in interpreting the results as it represents the average of all four quarters (assuming all quarters are of equal yield). There is a danger that cows with infected quarters may go undetected, particularly if they have only one infected quarter with the other three having low SCCs. Above, an example of the dangers of interpreting composite cow SCC.